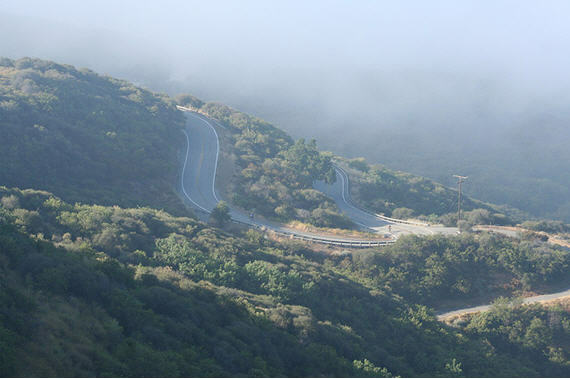 Latigo from PCH to Kanan – A truly amazing climb. It is long. At over 9 it is one of the longest climbs anywhere in the range. It has amazing views of the ocean. Almost immediately you can see huge portions of the Pacific Ocean. On a clear day you can see most of the Channel Islands, Catalina, San Nicolas and San Clementa. On foggy days the fog often creates neat rolling views of the ridges as you climb higher and higher. It is never super steep. The first couple of miles are the hardest but even they are gentle enough that you can get a good and consistent pace going. The road winds back on itself. As you climb higher and higher you can look back down the mountains to see the road wind all over the canyon much like some of the most classic Alps and Pyrenees climbs found in Europe. It gives you rests when you need them. The middle section tapers off on the climbing and even flattens out to let you catch your breath. The flat to slight downhill section is nice and curvy. If you don’t get a smile on the middle section you need to stop road biking. It has two summits. Just when you think you have made it to the top after climbing more than 2000 feet you get to drop several hundred feet and them make them all back up plus some. You get kilometer countdowns starting at 4K from the top of the final summit. Very little traffic, especially after the first two miles. Lots of stars live near this road and the chance for a sighting is pretty good. 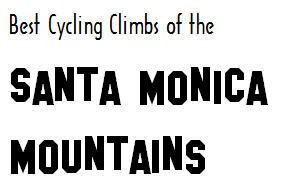 Lance has often called it his favorite climb in an area that was critical to his training for many of his 7 tour wins. Sure it helped that Sheryl Crow lives here, but if it is good enough to be Lance’s favorite I guess it can rank pretty high on my list as well. You have to ride on a fairly hairy (especially in summer) section of PCH to get to it.